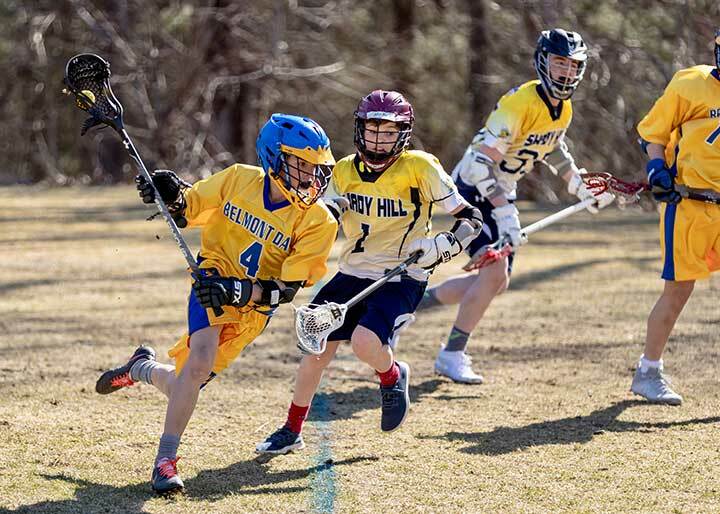 After opening their season with a home loss against Shady Hill (8-3), the boys’ lacrosse team flipped the script on the road against Beaver this week. Jacob Gregor’s goal on the opening face-off gave Belmont Day a lead for the first time this season and the Blue & Gold didn’t look back. With steady offensive pressure throughout the game, Belmont Day was able to maintain a 2-3 goal lead for all four quarters and finished with an impressive 11-8 win. Cole Lemack-Bremen and Theo von Gottberg joined Gregor with multiple goals on the afternoon, and sixth grade newcomer Henry Buckley-Jones was impressive on both ends of the field. Co-captains Rosie Schrag and Cameron Colbert had strong games for their respective teams during JV ultimate’s third intrasquad match this week, which was decided by one point! The track team improved to 2-0 following a decisive win against CRS. Toby Gauld ran a strong 1600m (7:19) and 800m (3:22) for the Blue & Gold, while classmate Dana Chang shined in the 50m. The girls’ lacrosse team scored 4 goals in the final 7:00 before falling to Beaver 9-7. Classmates Ellie Kadnar (goal) and Alice Morton (assist) were both heavily involved in the offensive surge. Noah Brauner had a breakout performance handling the disc during varsity ultimate’s 11-6 road win over Needham this week. Dylan Skenderian was a scoring threat all game for Belmont Day. The varsity tennis team evened their record at 1-1 with a 5-2 win over Fenn this week. Julian Tinmouth and Ellora Roy showed great chemistry during their convincing 6-1 victory at #3 doubles. Zephy Borisy and Erika Tinmouth have been strong leaders for the JV tennis team this spring and are looking forward to their first interscholastic match of the season after the break.